Choose from a wide range of toys for girls. Girls There are 32 products. 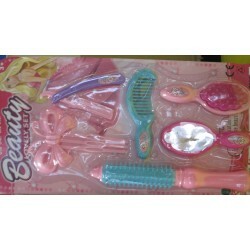 Three assorted plastic beauty sets; chunky designs for young ladies. Chunky plastic beauty set - 2 assorted designs. Great for young ladies. Using the bottle caps provided, create your own jewelry. Create your own friendship bracelets, includes charms, thread and beads for 8 bracelets. Display Box Of 9 plastic body dolls; 2 assorted coloured baby clothes. Moveable arms, legs and head. Display Box Of 9 ethnic baby dolls. 3 assorted colour baby clothes. Plastic body with moveable arms, legs and head. Little plastic doll in a gift box with a bicycle and 3 sets of clothes.